After the workshop Kathi and I co-presented, more than one hundred feedback forms had been turned in on the spot. 97% of the attendees loved our content, loved our takeaways, loved us. Ahhhh … so much fun! A few shared some concerns about whether or not we had fully covered all the topics listed in our workshop description. Fair enough. And lesson learned: Next time, we’ll be sure to use our workshop description as a content checklist when developing a new message. And then there was the one feedback form folded into eighths. Not simply in half or even in quarters. It was folded into well-creased eighths. Opening it, the first thing I noticed were all the exclamation points after the written comments. Then, I saw the multiple underlinings that emphasized the comments. Finally, all the check-marks lined up in the “strongly disagree” column on the form. Wow. She really hated us. When you put your words in front of an audience, as a speaker or a writer, you’re opening yourself up to feedback. And if you’re the type of person who is likely to fixate on the one negative remark despite ninety-nine positives, you’ve got to make some pre-decisions prior to receiving feedback. Your first pre-decision is to pre-decide what approach you will take to feedback. You can ignore or even refuse all feedback. While this approach will protect you from being hurt by unnecessarily harsh critics, it will also keep you from hearing valuable input that could help you grow. You can take all feedback straight to heart. While this approach may seem incredibly humble and selfless, it can also be the stance of an unnecessary martyr. The best approach is to “take the meat but leave the bones.” Embrace honest feedback that offers concrete suggestions from which you can learn and grow. Reject input that is petty, mean-spirited, even vindictive. So, the next pre-decision you need to make is which type of feedback you’ll take from whom. Accept Earned Evaluation from a trusted mentor. It’s “earned” because you’ve paid for it or asked for it. It’s “evaluation” because the person giving you feedback is drawing from years of experience and expertise to help you learn, grow, change, and improve. Invite Earned Exploration from a peer. It’s “earned” because you’ve given them permission and you’re in an ongoing trust relationship, perhaps in an accountability or mastermind group. It’s “exploration” because they don’t have the authority to tell you what you’re doing wrong; they ask clarifying questions based on their own perspective. Ignore Unearned Evaluation and Unearned Exploration. It is an act of presumption for someone who has not earned the right to speak into your life to suddenly barge in and tell you what you’re doing wrong or ask you a bunch of questions. You do not owe such people anything. After an event, whatever you do, don’t sit in the parking lot and read through your audience evaluations. You are at your most vulnerable right after speaking. You’ve poured yourself out, and you feel depleted. Do not reach for anonymous feedback forms to refill yourself when you’re feeling empty. Go home. Rest up. Exercise. Eat well. Gain some distance and perspective. If your message was videotaped, watch it and self-evaluate before even touching your audience feedback forms. I find critiques sting less when I can say, “Yeah, well I already figured that out!” Sometimes, I find flaws in my message and hope nobody else did; finding out they did, too, keeps me growing. The best way to avoid presumptuous people who have not earned the right to speak into your life is to have someone presort your audience feedback forms. Have a trusted friend or mentor go through the evaluations to weed out all unnecessarily detailed or mean-spirited ones. There’s no point reading comments about things you can’t or won’t change. In the case of the feedback form that was folded into eighths? Her complaint was the very thing that most attendees loved: our stories. Never let an outlier get into your heart. Their feedback isn’t about you at all. And while you’re at it? Don’t let positive feedback go to your head. As a Christian communicator, you know it’s not about you, either. 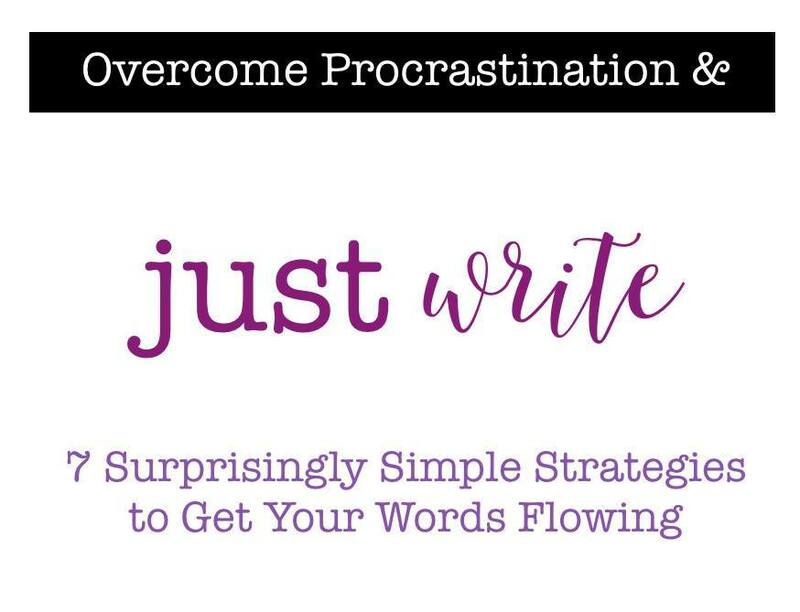 The FREE beta version of “Overcome Procrastination and Just Write: 7 Surprisingly Simple Strategies to Get Your Words Flowing” is ready! And I’d ❤ your feedback. 9 short video lessons … 2 downloadables … complete the whole thing in under an hour. This is so good, Cheri! I especially liked this part: The best approach is to “take the meat but leave the bones.” Embrace honest feedback that offers concrete suggestions from which you can learn and grow. Reject input that is petty, mean-spirited, even vindictive. I learned so much from you about a year ago when you were reviewing evaluations from the West Coast Christian Writers Conference (supplemented with your beautiful graphs and data). You showed the board members how to discard the “outliers” and focus on the input that was most constructive and helpful. Thank you for that, and for this bonus info!